DARTH VADER #7 begins part one of “The Dying Light” and it seems only fitting as Vader along with the Grand Inquisitor are out to snuff out any last remaining Jedi. Writer Charles Soule gets readers reacquainted with a Jedi we don’t have much information about. Jocosta Nu was last seen on the big screen as the lead archivist for the Jedi Order and now also she is departing her ever vast knowledge to Jedi Holocrons. Jocosta was never seen as a threat in the movies but in Vader #7 proves that her knowledge is one of the most powerful weapons against the Emperor and the Empire. Soule does a remarkable job fleshing out her story and taking the frail librarian to Jedi badass! Meanwhile, Vader is dishing out his own lessons of cruelty and loss to the Inquisitors. Vader is teaching painful lessons to his new recruits and Soule continues to make his villainy ever growing. 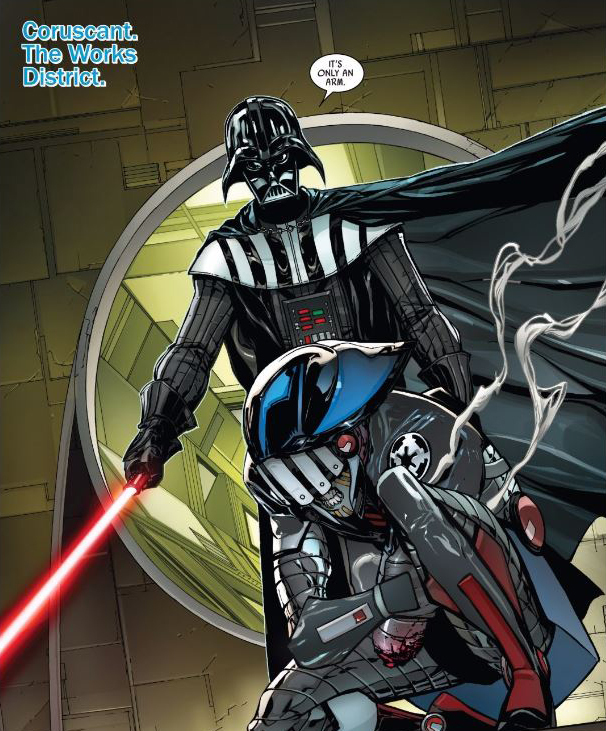 Soule has a death grip on Vader and his motivations and takes him to a whole new level. And unlike the earlier issues of Vader where Soule used dialogue and exposition sparingly, it’s not in short supply here. There’s a lot of explaining that needs to be done here between Vader and the Emperor, Vader and the Grand Inquisitor and Jocosta and Gar. It’s certainly not too much because this is setting up a whole new chapter in the series. 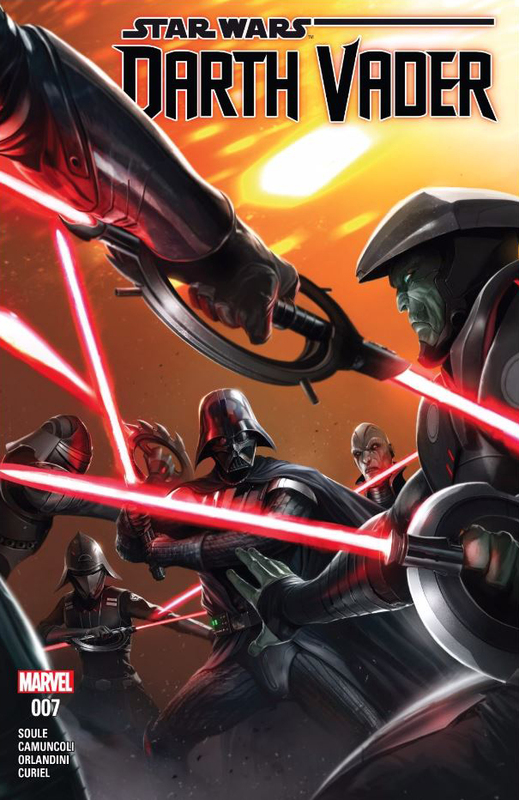 Getting an inside perspective on Jocosta and what her long-range plans are made for an even better story and Soule lays out a bigger mystery that keeps readers and Vader guessing. The big picture feels enormous now and we are all still in the dark. Giuseppe Camuncoli artwork continues to be stellar and he jumps fluidly from Coruscant to the outer reaches of Jocosta’s hideaway. Readers are never at a loss for their location and it never feels jarring or rushed. Camuncoli has the look, feel and consistency that will please any Star Wars fan. Darth Vader #7 is a great jumping off point for this new storyline and the intrigue and mystery that Soule lays out is what continues to make Vader the standout of the Star Wars line of books. A great jumping on point for new readers and a stellar addition for long-time readers. I highly recommend picking up this issue and if you are a newcomer pick up all the books leading up to this. You won’t be disappointed!